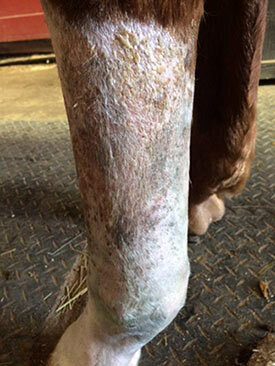 ExCellR8TM topical cream is for use on the Legs and Joints of horses and may naturally help support the control of inflammation and its residual associations due to over exertion and minor injury in the hoof, hock, knee, fetlock and pastern joints as well as the tendons and ligaments in horses. Given the all-natural properties of its protein extracts, ExCellR8™ may support continued soundness through regimented daily maintenance applications. DermaGenR8 Equine Topical Gel is an all-natural, acelluar derivative product indicated to accelerate the aid in healing of all major and minor skin wounds, cuts, burns and abrasions. Given the all-natural properties of its acellular derivatives, DermaGenR8 can promote skin healing on even the most difﬁcult locations in record time along with reducing the amount of proud ﬂesh and scar tissue formation. DermaGenR8 is one of the many ﬁrsts of its kind of products researched and developed by our team of PhDs and DVM to topically deliver acelluar derivatives to equines. Equi-Stem has partnered with Vet Cellect LLC to bring Brand-New-First-Ever-to-the-Industry Proprietary Acellular products to the masses. These products can be used on all horses! Equi-Stem customers will receive a special exclusive price with at least 20% off all products (available now and coming soon) distributed by Vet Cellect LLC. To receive this exclusive discount, Equi-stem customers should contact Tara Long to place their product order. 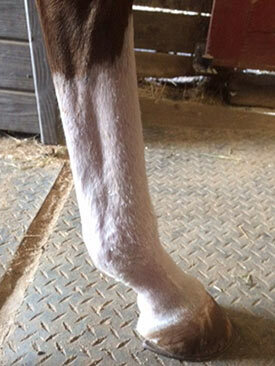 DermagenR8 equine topical gel for scratches. To the left is a picture of an 8 year old Quarter Horse Mare who was diagnosed with Scratches and Cellulitis back in November of 2016. For 7 months, the owner tried common treatments and antibiotics prescribed by their treating veterinarian, but there was not much improvement. We started a trial in late April where the mare was treated with DermagenR8 and in 15 days, the mare was completely healed and back to work. The final photo of the mare is to the right.